GARDEN GROVE, CA NOVEMBER 29, 2012: Every year since the King of the Hammers inception, Raceline Wheels has had multiple sets of Monster Wheels on course. 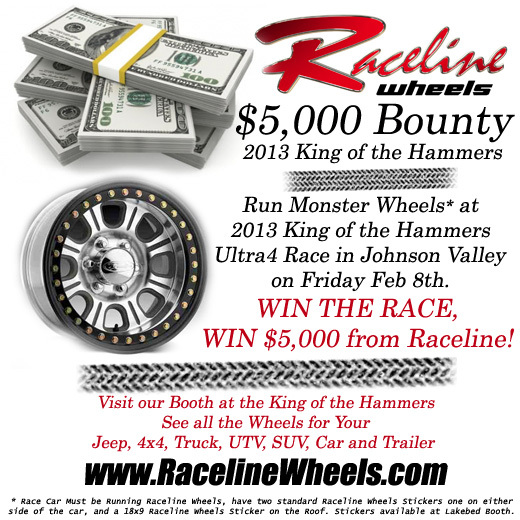 This year the Raceline Wheels team is adding a $5,000 bounty for the 2013 King of the Hammers winner in the Ultra4 race on Friday February 8, 2013 in Johnson Valley. “We have always been about supporting our racers, who in turn support us. This is just one more opportunity that we are happy to put towards their success!” said Greg Mulkey, Raceline Offroad Brand Manager. To qualify for the $5,000 bounty the Ultra4 Race car must be running Monster Raceline Wheels. The car must have two standard size Raceline Wheels stickers, one on each side of the car and an 18”x9” Raceline Wheels sticker on the Roof of the car. Stickers will be available at the Raceline Booth all week and at contingency. 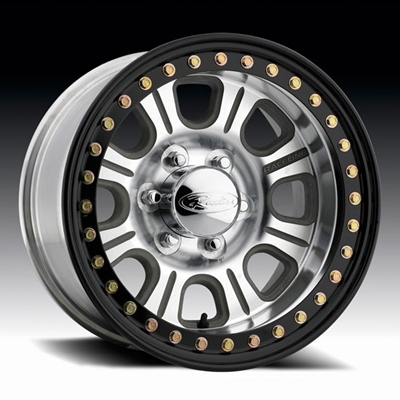 All the shiny aluminum wheels will also be on display in Vendor Row alongside many other wheels that are common for Jeeps, UTV’s, SUV’s, Trucks and Cars. “This is an event that we look forward to every year,” said Mulkey. “Supporting the racers get to the finish line is only a portion of the week, the fun part for me is getting to meet all the people from across the country that run Raceline Wheels on their trail rigs.” Raceline will be in HammerTown the entire week for any technical questions for rock crawlers, tow rigs, trailers, UTVs and race vehicles. Outside booth is located on 4 Wheel Parts Ave at Warn Way.